This entry was posted in boyle heights, Events, Food, Reviews by bhhapa. Bookmark the permalink. It was great! I made a strawberry liquado from the fresas that I bought at the FM…Hmmmm….So yummy.. I plan to go to the next one too. As pointed out, there were very few vendors…Hope to see more soon. Incase you missed the roasted peanuts, check em out…They are so good and go hand in hand with a cold beer. Also, someone please alert the cupcake people that bringing a few amount of cupcakes(about 15) doesn’t cut it in Boyle Heights…More please…Overall good food, good music, good vibes. boyle heights needs to get the cupcake vendor from el sereno farmer’s market – mardy’s munchies. best cupcakes and baked goods in l.a. It was great to see this come about in Boyle Heights. I grew up in this area and i’m so excited to see the very positive changes happening all around for this great community. 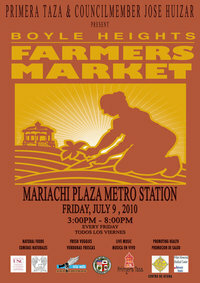 I am very excited about “finally” getting a farmers market here, seems they have them everywhere else! I bought lots of strawberries and blueberries, avocado and sage..yes sage!! I dont know how missed the peanuts..i look for them this coming friday! Hope everyone can come out to support. I didn’t see any kettle corn…perhaps i was just to excited about it all…will keep my eye out for that too! Congrats on a Farmers’ Market, but WHY IS BOYLE HEIGHTS FARMERS MARKET THE SAME DAY AS EL SERENO’S? THEY ARE WITHIN THE SAME DISTRICT. SHAME ON HUIZAR’S OFFICE FOR SUCH BAD PLANNING & MAKING EL SERENO THE STEP-CHILD THEY ALWAYS ARE BEING TREATED AS. BTW, EL SERENO STARTED THEIR FARMER’S MARKET IN MAY! Though El Sereno and Boyle Heights are both in the same district, they are different neighborhoods. Each with a large population of its own, especially Boyle Heights. As a BH resident i would probably never go to the El Serano farmers market. too much out of the way. The BH farmers market is walking distance. Personally i think that Boyle Heights could support two farmers markets, one on the northern end one on the southern end. Also i dont think Huizar had anythingto do with the planning. I think this is all community leaders work.